The DMS-06020 Active Shooter Victim Card Deck. 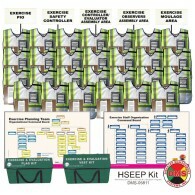 Designed to be used as a training aid in the classroom or drill scenario. No need to manually make up victim index cards prior to your drill any longer. Ideal for tabletop training as with these victim cards, personnel can attach primary triage ribbon t.. The DMS-05843 Victim Card Set. Designed to be used as a training aid in the classroom or drill scenario. No need to manually make up victim index cards prior to your drill any longer. With these victim cards, personnel can attach primary triage ribbon through arm holes. All DMS Victim Card sets now ..
New! These Pediatric Victim Cards feature Initial and Secondary symtoms. Ideal for training with the DMS-05763 Primary Triage Ribbon Dispenser. 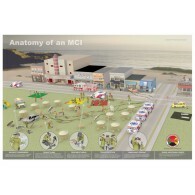 Designed to be used as a training aid in the classroom or drill scenario. No need to manually make up victim index cards prior to your drill any longer. 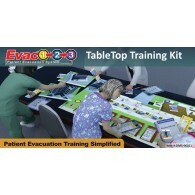 Wit..
DMS-06028 - SURGE Tabletop Training Kit for Hospitals Optimize your facilities’ ability to effectively manage a patient surge with this one-of-a-kind tabletop training kit. Players assume HICS position roles under the command of the Casualty care Unit Leader as they prepare for and manage an infl.. The DMS-05930 S.T.A.R.T. Triage Trainer Wheel, Trainer's Package. Learning triage should be as simple as a process of elimination... after all, that's what it is. By placing S.T.A.R.T. into a rotating wheel format, the confusion of the algorithm is removed and learning becomes easy. The k.. The DMS-05930 S.T.A.R.T. Triage Trainer Wheel. Learning triage should be as simple as a process of elimination... after all, that's what it is. By placing S.T.A.R.T. into a rotating wheel format, the confusion of the algorithm is removed and learning becomes easy. The key to rapid triag.. Instant reference START Prompter Algorithm on front, JumpSTART Pediatric Algorithm on back UV coated 3.5" X 2" cards DMS-05704 250 per pack Shipping Weight 2 lbs ..